Where do we even start with this session? This is definitely one for the books. 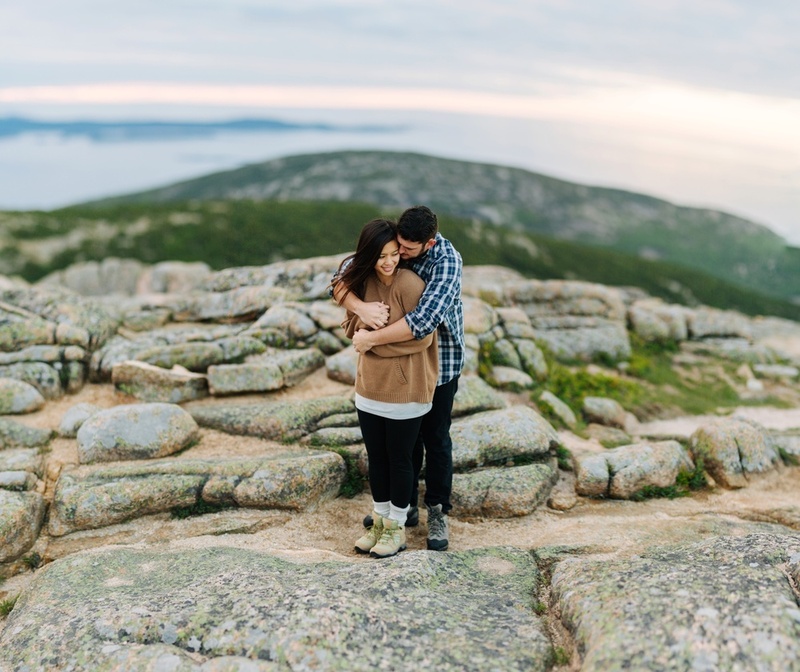 Jake & Jill get 1,000 stars and high fives for driving, yes DRIVING, all the way from Tampa to Acadia National Park in Maine for their engagement session. 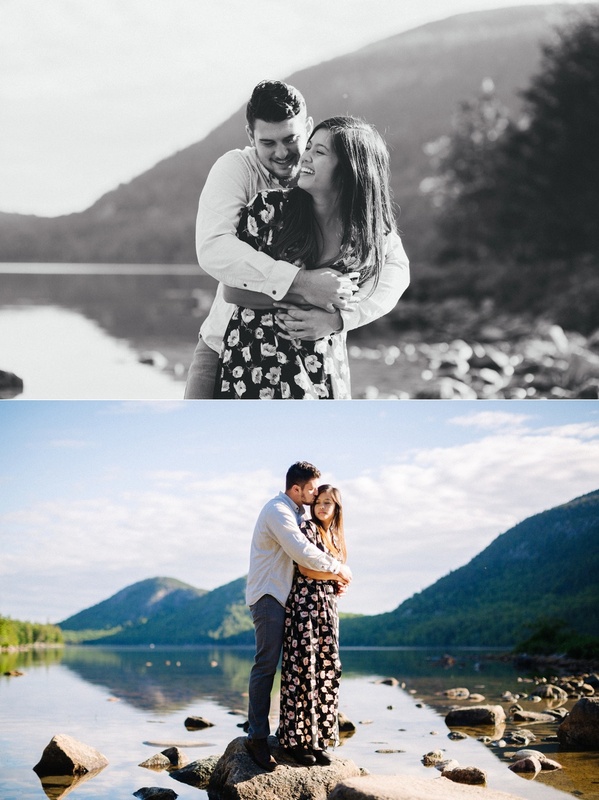 A few months back, Jill asked if we were traveling at all because they wanted to do something "epic" for their session. 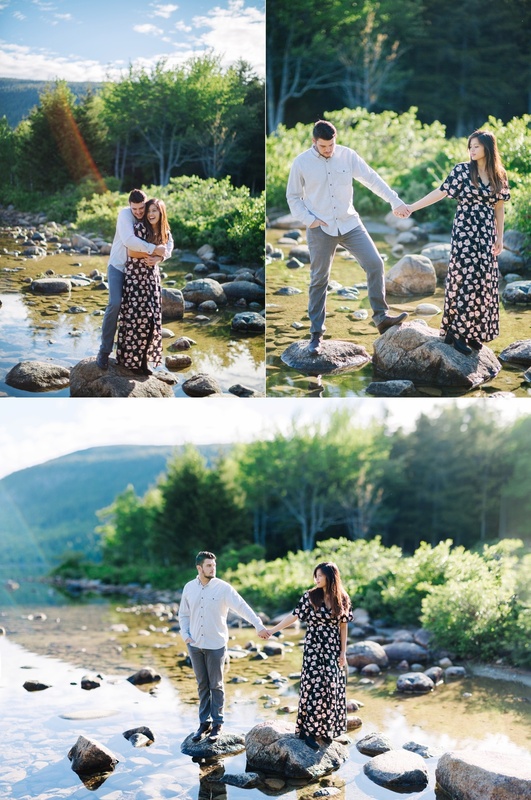 We mentioned that we would be traveling up the coast in New England with Jake's family in June and that we'd love to do a session in Acadia National Park in Maine. Before we knew it, Jill and Jake had planned their own road trip and the date was set! 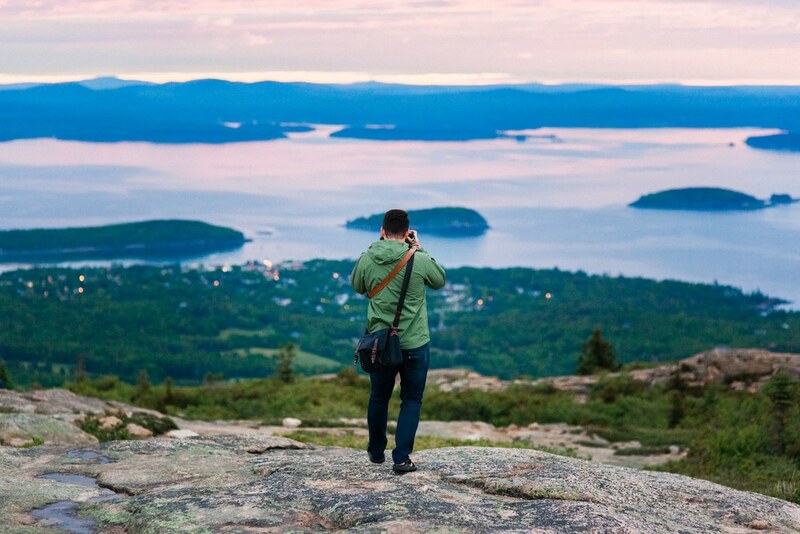 As we started to plan out the session, we discovered that the summit of Cadillac Mountain is the first place in the United States that you can see the sunrise. 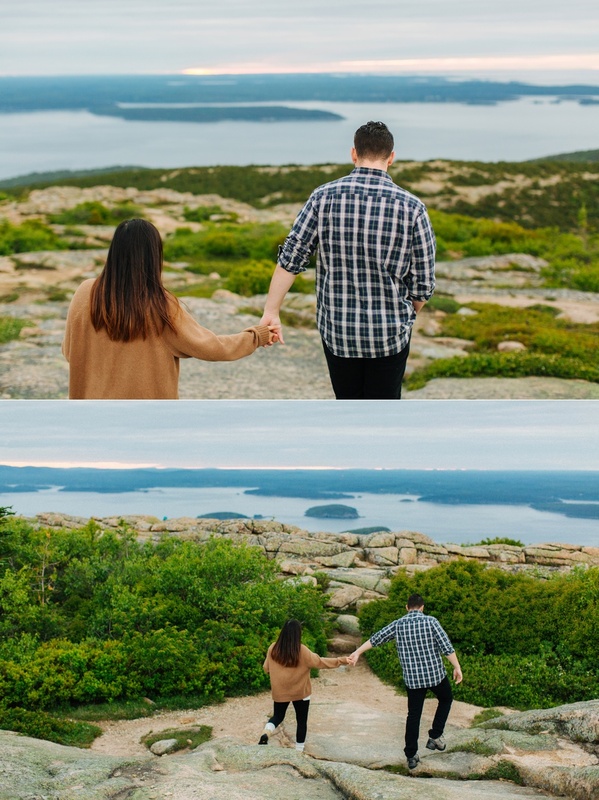 We also discovered that the sunrise was at 4:30 am... which means we had to make our way up there around 3:30... which means we woke up at 2:30... which means they had to start getting ready even earlier than that! Oh, did we mention that they were camping? Yeah, they're SO AWESOME. Jake and I met in the seventh grade. His first memory of me is one where I grabbed his face while on a field trip bus and said, “When did you get so cute?” I don’t remember this at all… of course. After that we continued going to the same school until I left for college. We were never close friends throughout that time but had some of the same friends. God was saving that part for a later time in our lives ;) I moved out of Tampa for college and when I moved back, Jake reached out to me. He asked me if I knew of any college-aged Bible studies or any recommendations for churches in the area. This was a very unique and life-changing point in both of our lives. At the same time (we didn’t realize this until later) God was calling us to give our lives to Him completely, something we hadn’t done fully before. We immediately had a God-given special connection because of this. We became best friends and loved each other dearly in this way. Eventually, we realized that God could be moving this friendship into something more! The transition from friends to dating was funny, awkward, and felt like forever because of how shy we were in telling each other how we felt. But as soon as the transition began, we already both knew and expressed that we wanted to marry each other! Our love has grown deep ever since and in ways that only God could design. It is so beautiful and a reflection of His perfect love for his people. Trying to stay warm. It was pretty cold for it being mid-June. We got engaged on May 9th, 2016. I had moved to Dallas nine months before for school and Jake had come to Dallas to help me move home. We packed up my car and started our drive home to Tampa. Anyone who knows me, knows I am all about good food, good nature, and good activities. If I get the chance to stop and do any of these things, I am one happy gal! Anyways, this totally meant that I asked to stop on our drive home almost any chance I got (not knowing Jake had a surprise waiting for me in Tampa). Eventually with the amount of “no, we aren’t stopping there” (after the third waterfall sign I gasped at and asked to stop), I knew something could be up. When we finally arrived at my house, I opened the door and I saw a pathway with balloons along the side and a big sign that said ‘Welcome Home’. All of my family and Jake’s family were standing there with huge smiles. I went to hug my mom who stood right under the sign and as soon as I did this, Jake tapped me on the shoulder from behind. 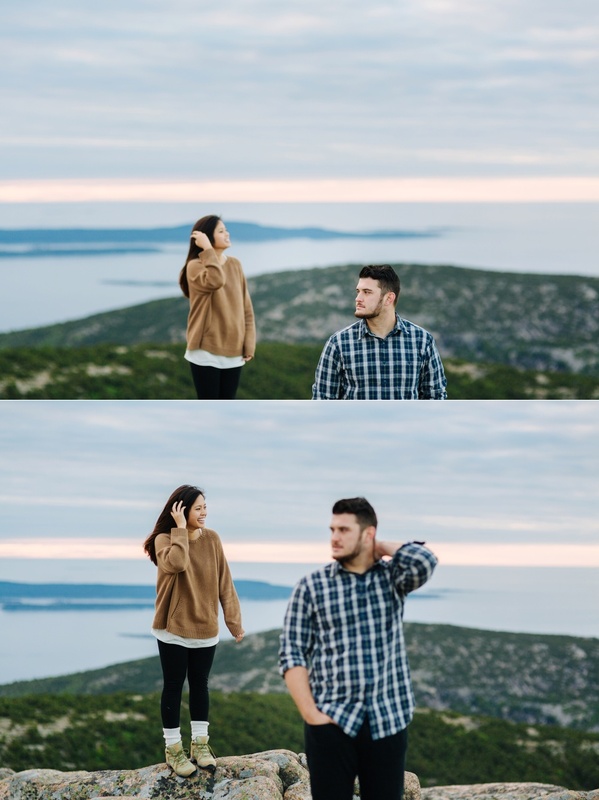 When I turned around, Jake was on one knee (music was playing, pictures were being taken, it was so quiet), and in that silence, Jake told me he loved me and asked me to marry him! January 2017 in Tampa at Watermark Church and The Rialto Theatre. The sun FINALLY broke through the clouds, just in time for an outfit and location change. We made our way down the mountain to Jordan Pond. 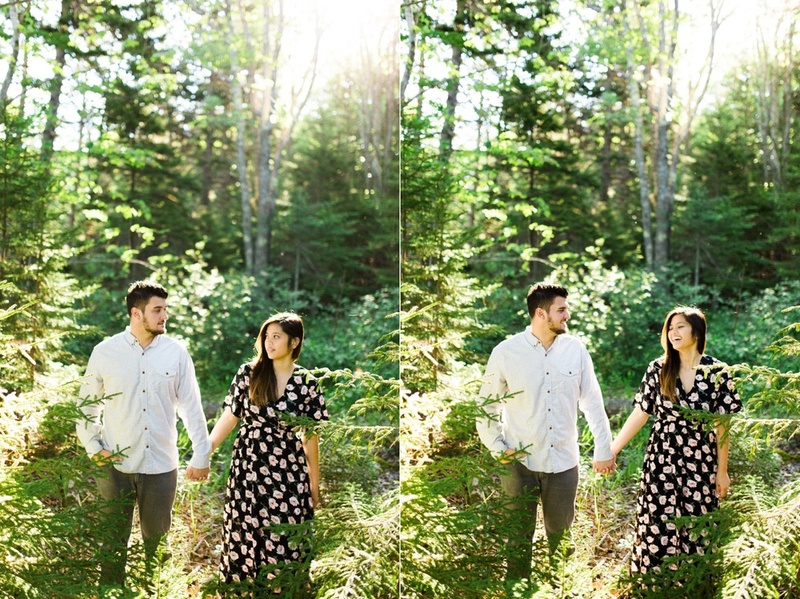 PHOTOGRAPHER NOTE: We love these next three images and how they display the affects of the sunlight hitting the lens. When I was asked to write something about Jill my initial response was “how many pages can I use”? I asked this because when I think of Jill, I think of so many things about her and it would be hard to simplify them all down into a short and sweet summary. That being said, I will do my best. Jill is my favorite person on earth. Her personality, smile, many talents, and willingness to serve others (believe me the list goes on) are all out of this world. No, literally, I mean they are out of this world in the sense that they don’t look normal to a fallen world like ours. Some people look at sunsets, mountain peaks, beautiful flowers and all sorts of other nature, and say “wow, God’s creation is so astonishing”. Truth is, I agree with them and enjoy nature as well, but the most beautiful creation that God perfectly crafted in my opinion is Jill Cariaga (soon to be Jill Collins). She is a reminder to me of our Lord and savior Jesus Christ every day. She reminds me of how God has called His children to live. She reminds me of how amazing our creator is. When I spend time with her, talk to her, and even just look at her, she reminds me of just how awesome God is (not to mention her contagious laugh that can cure any bad mood). She is a servant to Christ, a beautiful daughter of God, and a valuable tool of the Holy Spirit. She is a gift to all that know her. Her laugh is contagious and her zeal for life is inspiring. She is a lot of thing to many different people. A friend, a daughter, a sister, a cousin, a niece, an aunt, a mentor, a co-worker and the list goes on. To me though she is my Jilly… my precious woman that I am eager to marry. As I count the days until we enter into the covenant of marriage together, I can’t help but think about how immensely blessed I am. I have done many things in my life that could and should disqualify me from receiving such an amazing gift. God knows this, and He has still chosen to grant me a wife, but not just any wife, the wife I have always prayed for- a wife that genuinely loves the Lord and aims at glorifying Him with her life. I love her so much. Sometimes I wonder how I can love someone so much, but then I remember that Jesus loved us so much that He gave His life for us on the cross and compared to that I have a lot of room for my love to grow. I am so excited to see our love grow each year. I guess if I had to describe Jill and keep it short and sweet, I would say she is beautiful inside and out. To God be the glory for Jill’s unreal/unbelievable amazingness.